An Alocasia Plant, native to Asia, is also called an Elephant Ear Plant or African Mask Plant. Alocasia Plants have large, dark-green, glossy, heart-shaped leaves with wavy edges. These stunning veined leaves come in red, bronze, blue-green, and purple. 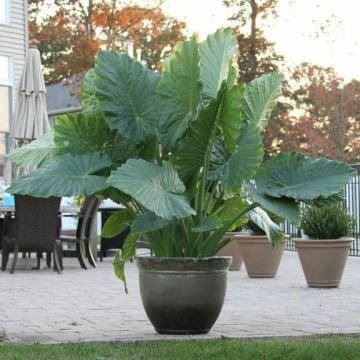 If you are searching for a dramatic, very different looking plant that can be as small as 6″ or as tall as a tree, an Alocasia Plant is a great choice. These plants do require extra care and attention. Alocasia Plants are very poisonous plants and should be kept away from children and pets. 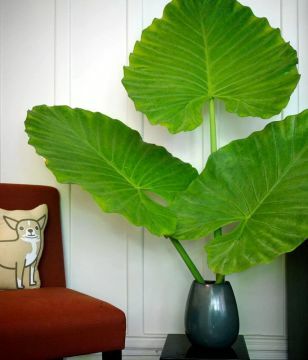 LIGHTING REQUIREMENTS: An Alocasia Plant requires very bright indirect light. Direct sun burns the leaves of an Alocasia Plant. CARE INSTRUCTIONS FERTILIZER: Fertilize an Alocasia Plant every two weeks from late March through September with a basic houseplant food at 1/2 the recommended strength. Never fertilize an Alocasia Plant during the winter. Too much fertilizer causes salts to build up in the soil and burn the leaves of an Alocasia Plant. TEMPERATURE: Alocasia Plants prefer warm temperatures between 60-80 degrees. Alocasia Plants becomes dormant with prolonged exposure to temperatures below 60 degrees, and may drop all of their leaves. Be sure to keep an Alocasia Plant away from air conditioners and cold drafts. During warm summer months, an Alocasia Plant can produce a new leaf every week and each new leaf may be twice the size of the previous leaf. HUMIDITY: Alocasia Plants grow best in high humidity. To increase the humidity around a house plant, place the plant on a tray filled with pebbles and water. Be sure the plant is sitting on the pebbles and not in the water. You can also increase the humidity around an Alocasia Plant by placing a small humidifier near the plant or grouping plants together. FLOWERING: The flowers of an Alocasia Plant are very small and inconsequential. PESTS: Spraying an Alocasia Plant with warm soapy water every few weeks helps prevent Mealy Bugs, scale, Aphids, and spider mite problems. It also keeps the large leaves of the plant dust-free. If an Alocasia Plant does become infested, spray with an ultra fine commercial insecticidal oil. This kills both the pests and their eggs. DISEASES: When Alocasia Plants are over- watered or when the leaves get wet, they develop a variety of diseases such as crown, stem, and root rot, Leaf Spot, and Xanthamonas. These diseases usually appear as dark brown or black spots on the Alocasia leaves, surrounded by a yellowish rim. The best way to prevent plant diseases in an Alocasia is to avoid over-watering, keep the leaves dry, and provide good air circulation around the plant. Once an Alocasia plant is infected, quickly remove the damaged leaves and any leaves that have fallen off, isolate the plant from your other plants, and treat with a commercial Fungicide. SOIL: Use an organic well-aerated loose houseplant soil that contains a good amount of peat moss for an Alocasia Plant. If the soil in an Alocasia Plant seems a little heavy, add some builder's sand or perlite. Variety: Amazonica, Acrorrhiza . Please call or visit to see if currently in stock.